It’s that time again….Time for our featured artist of the week: a native of North Philly, GhettoSongbird. Like, many black women in rock, her story inspires and makes you wanna dig deeper and explore the music that reflects her DNA. So without further adieu, 5 questions! Five amazing answers! Enjoy…. SHEILA: How did the name, GhettoSongbird come about? 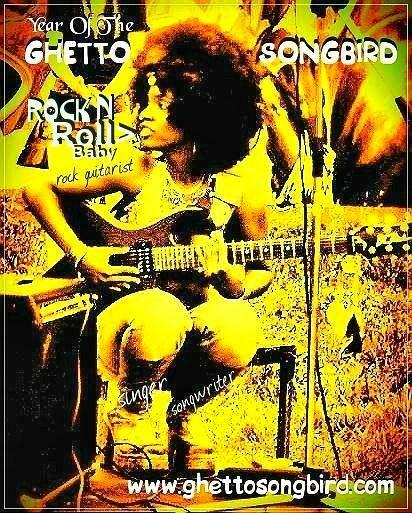 GHETTOSONGBIRD: On 16th St. in North Philly in the middle room on the 2nd floor every morning I listened to a songbird sing the most inspiring songs a young black ghetto girl could hear amid gun shots & everyday city life. I named myself after that bird the creator sent to me in hopes that everywhere I land, I could be that song of hope playing on someone’s ear drums. SHEILA: How would you describe your brand of rock music? GHETTOSONGBIRD: I never really put a label on it until others started naming it anything from rock-n-soul to ghetto-rock, so I stick with good old fashion rock-n-roll & allow listeners to come up with the cool names. SHEILA: You are a triple threat – singer, songwriter and musician. Have you always performed your own brand of rock music, or did your work evolve from another genre or work with other bands? GHETTOSONGBIRD: I started out writing to hip-hop beats, singing & dancing in talent shows as a teen, and having guitar players play for me. But as soon as I brought my 1st guitar from the pawn shop for $50 off of lay-a-way in my starving artist times, because my guitarist could no longer play for me, the songs I wrote on that guitar had a rock vibe. I started playing acoustic guitar by ear & developed a crush on the tone of strumming. A baby boy I was taking care of broke my acoustic guitar, which led me to pick up my electric guitar. I fell in love with it, even though it intimidated me. When I played the electric guitar through the tiny “Crate” amp my mother brought me, every one of my mother’s albums I ever rocked to, every sound of the ghetto I heard, every awesome guitarist that played for me, every seasoned musician I jammed with, every sound of world music I took in, every conversation, & notions I had about life gave birth to my brand of rock. I went on to play bass briefly in a rock band, and was the lead singer in a punk band for a very quick moment. But I knew I needed to focus on connecting my guitar with my voice & words. SHEILA: So you took a two-year break from performing. Tell us about what this period of re-emergence/re-birth has been like for you? Has your music evolved/changed? GHETTOSONGBIRD: I got married at one of my shows, in 2007, to my drummer . Three years later we had our baby girl, and a year later we had a baby boy. For the 1st time in 10 years of non-stop gigging I stopped to take it all in & focus on who I am as an artist. Before I was every show that I did, every “no” that I hoped I could turn into a “yes”, and every song that I wrote & perform, with no clear direction & a lot of frustration. Taking two years off to have a family blessed me time to nurture myself, my artistry, my business, and my brand. I was getting lost in the chase of trying to make it and fulfill what others wanted my journey to rush & do for their journey, that I forgot what I wanted. I love playing music & sharing my songs like that little songbird in my childhood window, hoping that I can inspire at least 1 person. My music is evolving whenever I play my guitar and discover new notes, while simply jamming with my children, who are evolving musicians. They free my mind from the business side, giving me peace & purpose beyond myself. Just when I think I know my sound, I’m blessed with a song that allows me to challenge myself. Ask my husband (who has been my drummer way before we got married), he has to hear my grunts & victories. This time around anyone who supports my artistry can expect a more confident singer/songwriter/guitarist with a stronger stage presence. Before I was learning as I went along with amazing band members changing all the time. Now I’m becoming one with my artistry & have a family of band members including Ronin Ali (Drummer), Chris Nelson (Keys), Drew (Hondo) Felder (bass) who’ve been playing with me for some time. 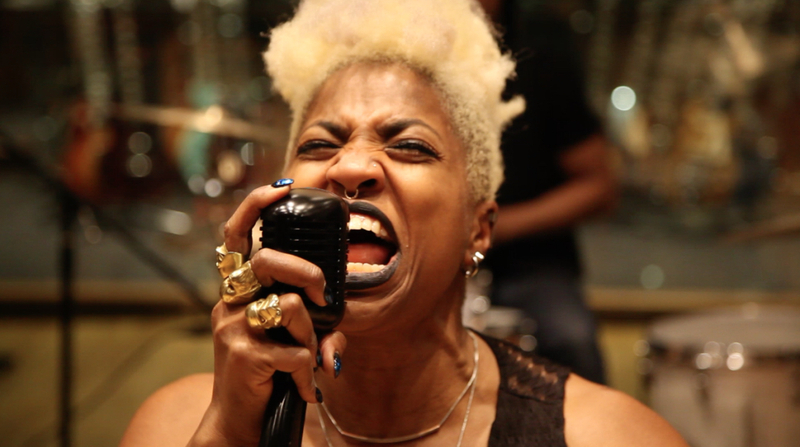 The energy & chemistry is so profound that in rehearsals we vibe right away & stage shows rock to the 3rd power! SHEILA: Tell us about your new release “Alley of the Earth.” Rock and roll and horror have always been bedfellows. But why did ‘you’ decide to go the horror route with this song and your music video? GHETTOSONGBIRD: Since I feel like I am starting all over I decided to re-release my 1st CD “Alley Of The Earth” that I recorded in L.A. 10 years ago with the help of my mentor Rosa Lee Brooks who wrote and recorded with the Legendary Jimi Hendrix in the 1960’s. She told me that I should do more with those songs, that had started out as a demo. To celebrate the 10th birthday of “Alley Of The Earth” I got in touch with a phenomenal director by the name of Sharvon P. Urbannavage, who I thought would think I was out of my mind once she read the treatment I wrote. 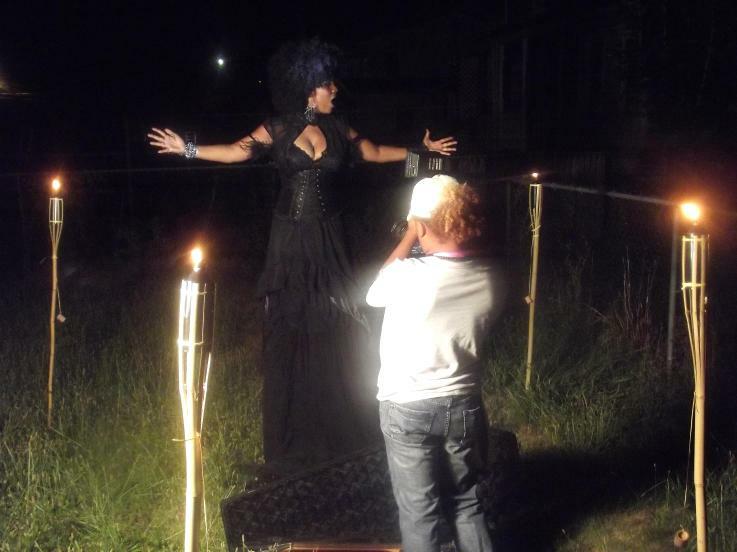 She understood my vision and the next thing I knew we were shooting a music video/short film in Easton, Pa.
And yes, it’s a horror theme, but it is my auto-biography in a metaphor. It’s the monsters of insecurities I used to create in my head that would haunt me whenever I felt like others were judging me. It’s the vulture like characters who I let pull at me because I thought they had genuine intensions. It’s my love for the horror film genre. It’s every ism I go through before and after a show. It’s my rock-n-roll dream. It’s how the creator continues to create me. It’s art imitating life. It’s Ghettosongbird killing her fears with passion, with her weapon of choice “My Warrior Guitar”, so I can rise like a Phoenix from the ashes celebrating my new found love for music and this rock-n-roll journey I’ve been blessed to endure. “Alley of the Earth” will make it’s world premiere on NiceandRough.com on Oct. 30th. Stay tuned for more details. SHEILA: I love that you are using your music to create value. Tell us about Assiah, your connection, and how you decided to donate half of the proceeds to assist her? GHETTOSONGBIRD: My husband introduced me to Assiah’s mother. I finally met this brave little precious doll at my daughter’s 1st birthday, around the time I 1st heard that she needed a liver transplant. Constantly hearing about how this baby girl was suffering, I felt helpless. Assiah and her courageous mother Rasheena”s strength inspired me to want to do more than go online and talk about me, my next shows and songs. I’ve been working with children for years volunteering, teaching, and providing childcare. As I was about to promote my video screening, Assiah had finally received the liver transplant and was recovering, but they still needed to recover emotionally & financially. So my next step was to connect it to my music. To learn more about Assiah’s story and to support this cause, go to www.assiahsliverfund.org. I’ll make sure to bookmark it and come back to read more of your useful info. Thanks for the post. I’ll certainly return.